Remember the pleasant memories when your Grandmother would make a pot of her famous baked beans? How great they were! Not only was it her famous served recipe but the fact that she cooked them in her treasured bean pot. The beans must methodically cook slowly to be kept from overcooking and burning. 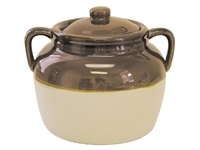 Our very familiar brown and white bean pots are made of stoneware, glazed to protect them. With one of these bean pots you will now be able to build your own memories for generations to come.